Special Containment Procedures: The primary sample of SCP-1361 is to be kept in an environmentally sealed chamber at a constant temperature of 4°C. SCP-1361 is to be fed a small mammal weighing 1-5 kg once per day, or as necessary to maintain its mass within 45-65 kg. In the event that the primary sample's mass exceeds 107 kg, 50% of its mass is to be removed and destroyed by incineration. All incinerations of SCP-1361 material are to be performed in environmentally-sealed areas and air is to be completely filtered before dispersal into the atmosphere. All persons handling SCP-1361 are to make use of a portable oxygen supply and wear appropriate safety gear. Secondary samples of SCP-1361 may be produced as necessary for testing purposes, using D-class personnel scheduled for termination as seed material. All secondary samples are to be stored in a separate environment from the primary sample. 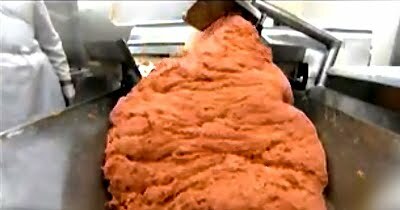 Description: SCP-1361 is an amorphous mass of animal tissue, similar in appearance to mechanically separated meat. Tissue analysis indicates that SCP-1361 contains DNA markers from 37 distinct species, including Bos taurus, Gallus gallus, Sus scrofa, Felis catus, Canis lupus, Mesocricetus auratus, Columba livia, and Homo sapiens sapiens, and that it consists primarily of muscular and connective tissue and fat. SCP-1361 also contains high concentrations of ammonium hydroxide and is caustic to exposed flesh. SCP-1361 possesses no sensory organs or internal structure and demonstrates no indications of being intelligent or aware of its environment. Due to its lack of specialized organs, pieces of SCP-1361 can be removed or reattached without any harm to the organism or the removed portion. SCP-1361 is capable of limited locomotion along flat surfaces by means of contracting and expanding itself. SCP-1361 has been observed to move at a constant rate of 1.3 meters per minute, irrespective of its current mass. Quantities of SCP-1361 smaller than 5 kg do not demonstrate an ability to move. When not interfered with by outside stimuli, SCP-1361 will move in a straight line until it encounters a barrier larger than its current height, at which point it will begin moving in a different direction. If SCP-1361 encounters any biological matter while traveling, it will attempt to form itself around it and engulf the object. Within 15-30 minutes of engulfing a biological object, SCP-1361 will digest it and its mass and volume will increase by the mass and volume of the object engulfed. SCP-1361 has demonstrated an ability to digest any plant or animal matter introduced to it, including wood, clothing, hair, bones, and samples of organic SCP objects not known to be destructible by conventional means. Non-organic material contained within the consumed object is not digested and remains within SCP-1361 indefinitely. SCP-1361 does not excrete any waste after feeding. SCP-1361 loses mass at a rate of 1 kg per day and must consume at least that much to maintain its mass. If not fed, SCP-1361 will continue to lose weight until it is no longer capable of locomotion, at which point it will begin to spoil and grow mold; SCP-1361 can be considered dead at this point and will no longer feed. Rate of decay, and the corresponding requirement to feed, increases dramatically if the temperature of SCP-1361 is above 20°C. If SCP-1361's mass exceeds 107 kg, it begins exuding a highly pleasant aroma, described by a D-class handler upon accidental exposure as smelling "better than a rare steak, crispy fried bacon, and a wet [EXPLETIVE DELETED] all rolled into one." Humans and other carnivorous animals exposed to SCP-1361 in this state will experience a strong desire to approach and consume SCP-1361, uncooked, regardless of the caustic damage caused to the hands, mouth, and throat by this process. Once eaten, the consumed matter will begin to engulf the subject from the inside, digesting and turning them into another instance of SCP-1361 over the course of approximately 4-6 hours. Testing indicates that consuming approximately 0.5% of the subject's body weight in SCP-1361 is necessary for the transformation to occur; however, individuals exposed to SCP-1361 and allowed to do so frequently consume far in excess of this amount, beyond the normal ability of an individual of their species. All secondary samples of SCP-1361 produced in this manner behave identically to the primary sample, except that DNA markers from the individual consumed will now be present. SCP-1361 remains in this state until its mass drops below 50 kg, either due to being consumed, due to pieces of it being removed, or due to loss of mass from not eating. Testing has indicated that the ability to digest a subject after being consumed is not limited to the periods when SCP-1361 is emitting the scent described above and that it persists after being cooked. The scent given off when SCP-1361 is cooked has been described as more pleasant than its uncooked scent; D-class personnel exposed to it have engaged in irrational behavior and physical violence in an attempt to gain access to samples of cooked SCP-1361.